Hart had six points (2-3 FG, 2-3 3Pt), three rebounds, two assists, and one steal in 17 minutes during Tuesday's 115-101 loss to the Bucks. Hart had been listed as questionable due to knee tendinitis but was able to give it a go. 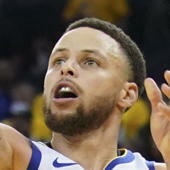 Nevertheless, given that the team is simply playing out the string, there's little reason for coach Luke Walton to rely on the hobbled Hart to play heavy minutes. As a result, the sophomore guard can likely be avoided across most formats across the final 11 contests of 2018-19.